Noted leaker and poster of pictures @evleaks just released an image that appears to show an unannounced Samsung Galaxy phone with a curved AMOLED screen. Past devices with curved glass, like the Galaxy Nexus and Nexus S, have had curves running from top to bottom. Not this one, though. Samsung's next device may sport a left to right curve, which makes it look kind of like a soggy taco shell. The last round of vague hints from Samsung had this device pegged for an October release in South Korea, but nothing beyond that. The company sometimes tests tweaked versions of its devices in the home market before implementing similar features in western countries. It's possible we'll never see the curved screen phone in the US, or maybe it will curve the other way by then, because really, this looks weird. The curve is actually the same left to right orientation as Samsung's recently released OLED TV, but it makes a bit more sense on a widescreen TV than a narrow phone. Other than the bizarre screen, this phone looks like a take on the Galaxy S4, which matches what the rumors have been saying to this point. 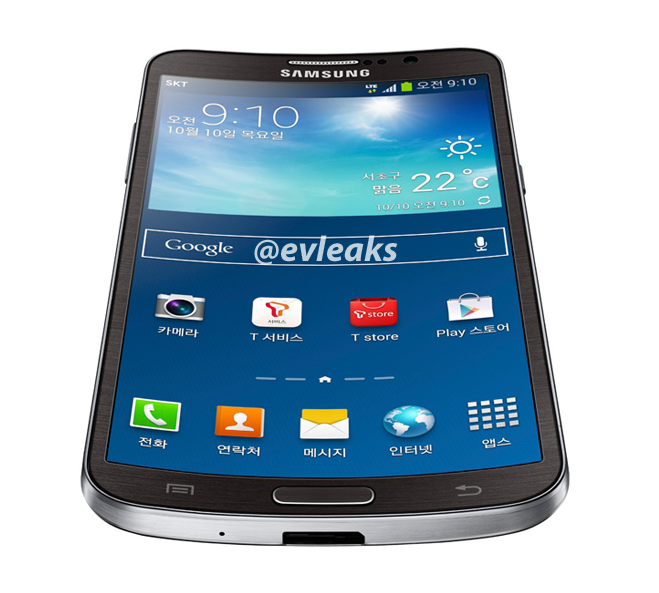 As for the name, some have been claiming the translated name is "Galaxy Round." Well, some galaxies are round, I suppose. Samsung's Korean rival LG is also working on a curved screen device, which will reportedly curve the other way. You can call that the right way if you want. Update: @evleaks has posted another image of the taco device (model number SM-G910S), this time with the back visible. It has LTE-A emblazoned on it, indicating support for LTE-Advanced. The back also has the faux leather look from the Note 3. 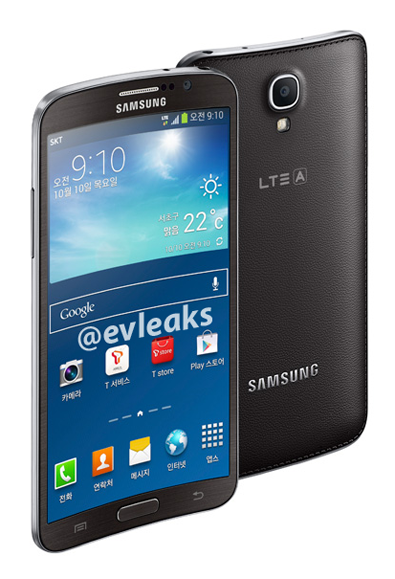 @evleaks also confirms this is a South Korean device only at this point.